And I was arrested. Some rat had tipped off the Security Ministry (the official name of the Department of Torture here in this Islamic Republic of BP). I knew I’d get out quick, because throwing a reporter of Her Majesty’s Empire into a dungeon would embarrass both BP and the Azeri oil-o-crats. The gendarmes demanded our film, but I wasn’t overly concerned: Before I left London, Badpenny handed me one of those Austin Powers camera-in-pens, on which I’d loaded all I needed. But I did fear for my witnesses left behind in Azerbaijan ”“ and for my source in a tiger cage in the USA: Pvt Chelsea Manning. Only after I dove into deep water in Baku did I discover, trolling through the so-called “WikiLeaks” documents, secret State Department cables released by Manning. 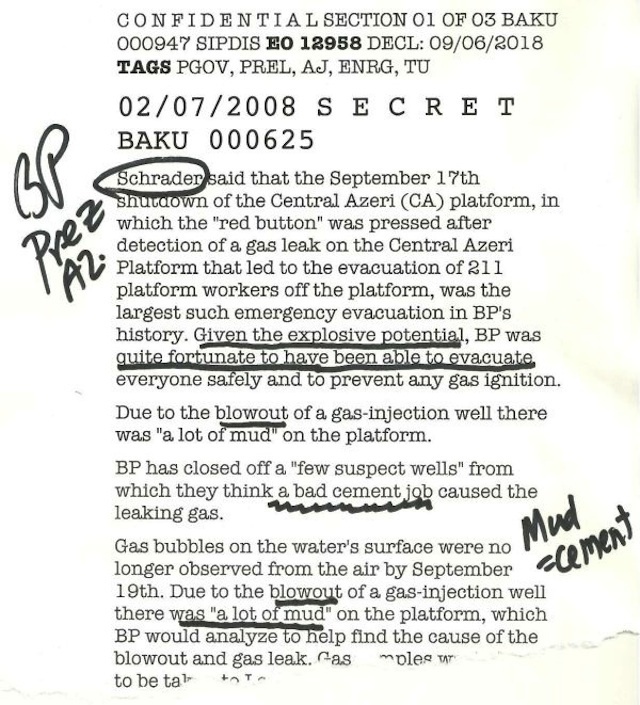 The information was stunning: the US State Department knew about the BP blow-out in the Caspian and joined in the cover-up. The US Ambassador in Baku got Chevron the answer: a blow-out of the nitrogen-laced cement cap on a giant Caspian Sea platform. The information was marked “SECRET”. Apparently loose lips about sinking ships would help neither Chevron nor the Azeri President Ilham Aliyev, the beneficiary of millions of dollars in payments of oil company baksheesh. So what about Chelsea Manning? 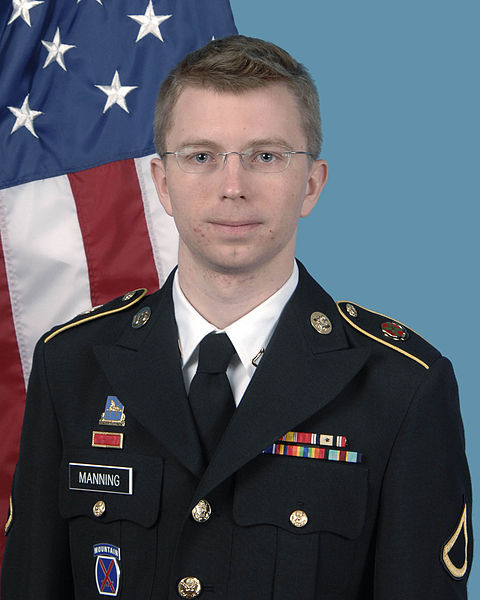 Manning has been charged with “aiding the enemy” ”“ a crime punishable by death. But Manning’s sole and only purpose was to get out the truth. It wasn’t Manning who wrote the cover-up memos, she merely wanted to get them to the victims: us. And since when did the public become “the enemy”? Had Manning’s memos come out just a few months earlier, the truth about BP’s deadly drilling methods would have been revealed, and there’s little doubt BP would have had to change its ways. Those eleven men could well have been alive today. Did Manning know about this particular hush-hush cable about BP’s blow-out when she decided she had to become Paul Revere and warn the planet? That’s unlikely, in the thousands of cables she had. But she’d seen enough evidence of murder and mendacity in other cables, so, as Manning, under oath, told a court, she tried to give it all to the New York Times to have knowledgeable reporters review the cables confidentially for life-saving information. The New York Times immediately seized on this extraordinary opportunity”¦ to ignore Manning. The Times only ran it when the Guardian was going to scoop ”“ and embarrass ”“ the New York hacks. Though there are limits. While reporter David Leigh put the story of BP’s prior blow-out on page one of the Guardian, neither the New York Times or any other major US news outlet ran the story of the blow-out and oil industry cover-up. No surprise there, though ”“ the most “prestigious” US news programme, PBS Newshour, was sponsored by”¦ Chevron Corporation. As a working journalist, and one whose head is likely to be in the foggy gun-sights of some jet jockey or a dictator’s goon squad, I have more than a little distaste for toffs like New York Times‘ former executive editor, columnist Bill Keller, who used Manning’s documents to cash in on a book deal and land star turns on television while simultaneously smearing his source Manning as, “troubled”, “emotionally fractured”, “vague”, “inchoate” and ”“ cover the children’s ears ”“ “gay”. Furthermore, while preening about their revelations from the Manning documents, the Times had no problem with imprisoning their source. I do acknowledge that the Times and Keller did editorialise that a sentence of life imprisonment without parole would be “overkill”. How white of them. When it was mentioned that Manning is no different from Daniel Ellsberg, the CIA operative who released the Pentagon Papers, Keller reassured that the Times also told Ellsberg he was “on his own” and did not object to their source being charged as a spy. And the Times‘ much-lauded exposure of the My Lai massacre? My late good friend, the great investigative reporter Ron Ridenhour, who gave the story to Seymour Hersh, told me that he and Hersh had to effectively blackmail the Times into printing it. Times man Keller writes that Manning, by going to “anti-American” WikiLeaks, threatened the release of, “information that might get troops in the field or innocent informants killed”. This is the same Bill Keller who admits that he knew his paper’s reports in 2003 that Saddam Hussein had weapons of mass destruction were completely false, but that he ”“ as editor ”“ covered up his paper’s knowledge their WDM stories were simply bogus. Those stories validated the Bush propaganda and helped tip the political balance to invade Iraq. Four-thousand US soldiers died. I guess the idea is that releasing information that kills troops is criminal, but that dis-information that kills troops is quite acceptable. Maybe I’m just cranky because I wouldn’t have seen my own sources vanish and my film grabbed if the Times had only run the Manning facts about BP and Caspian when they had the chance. Look, I’m only picking on the New York Times and PBS Newshour because they are the best in America, God help us. What other lives could have been saved by the Manning revelations? Lots. Watch this space: I promise more aid to the enemies of the state ”“ which is YOU. Greg Palast investigated the BP Deepwater Horizon deaths for Channel 4 Television UK . Those dispatches are contained in his highly acclaimed book Vultures’ Picnic, named Book of the Year 2012 on BBC Newsnight Review.